Full on notebook for this one. I am going to trace a gentle line between three somewhat disparate expressions of Middle Eastern religion. There are many ways to join them, but I am looking at their being joined more so than pointing out the nature of that joining. You might want to read an earlier post first. First up, some quotes from the Gospel. As an aside, I would like to point out the connections between what is going on here and the sorts of ecstatic and gynocentric religion I have talked about elsewhere. The first person he goes to is a woman known for having been possessed. If, like me, you tend to read the Biblical material as myth dressed up as history, then this is a story about a spirit manifesting in a spirit-filled woman’s life and setting it in order. It is an origin myth for a spirit’s cultus. 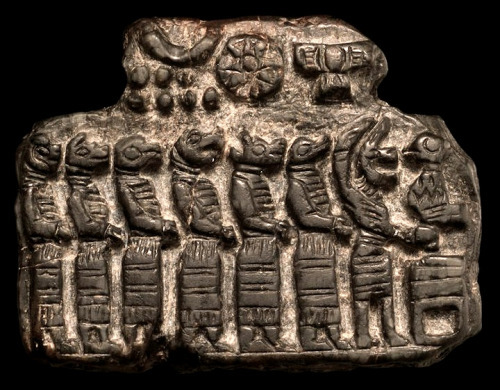 Let’s dig a little backward and take a look at a piece of art from Assyria, ca. 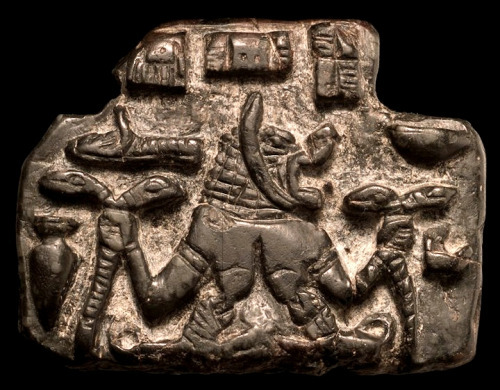 8th-7th century BCE (see here for the original and the source for the alt text). This isn’t subtle. Demon mother holding snakes, nursing dogs, the sick or dead person in the upper left, over her shoulder. Let’s look at the back. Above the seven figures, we see numerous positive celestial forces, from the sun to the moon, to the stars. The figures, while possessing animal features, are lined up in front of an altar in the process of making a sacrifice. So, here we have a mother of demons and seven demons. However, what the plaque asserts is that even these demonic forces operate under the domain of the heavens. What the plaque seems to express is the common allegiance of the demonic and the human to a higher order. It also makes the demonic figures the primary intermediaries between this realm and the higher. It is the demons at the altar, after all. A woman and seven demons. The authors of the Gospel seems to make the same connection I am between this Lamashtu and her seven children, on the one hand, and the Magdalene and the seven demons on the other. Moreover, in making Mary Magdalene Jesus’s first witness, it gives her a similarly privileged connection to Jesus and to heaven. Mary Magdalene, who has overcome being plagued by demons, becomes the intercessor for others similarly troubled. If we dig even deeper into our demonic archive, one of the earliest exorcism rites we can attribute to the Sumerians specifies that the demons ought to leave a man alone “because he is with his god,” i.e., he is in alignment with the heavens whom the demons, too, serve. Look to Zohar for a latter day example of this thinking: the demons are not evil alien to the divine, but they are the means through which punishment is inflicted and through whom individuals are brought back to, or kept on, the path of righteousness. Many expressions, many clothes, but something stable beneath them. Something that runs in parallel to the dynamic of angels and demons. How do you live for the future? It’s well said and I am sympathetic to the spirit of simplicity espoused therein, but it’s a little outside my usual bailiwick; I’m not sure there’s much I could say in specific.